This article will explain basic supply chain planning concepts and 7 reasons why you may need to use supply chain planning software to improve your operations. - At the strategic levels, a company tries to figure out the best strategy to deal with long-term capacities, facility locations, stocking points and management of distribution channels for the next 2-3 years. - At the tactical level, the planning process starts with the annual budgeting. A company makes a sales projection for the next fiscal year, identifies required investment, materials, capacity, and labor and tries to bridge the gap between the demand side and supply side. - At the operational level, a company deals with day-to-day operations such as Material Requirement Planning (MRP), material scheduling, production planning, sequencing, order release, order promising and vehicle routing. The expectation is usually high when a company decides to invest in a new enterprise software system. However, many of them find out later that a standard ERP system only enables them to manage the enterprise information in a big database. The much-complicated analysis must be done outside the system. 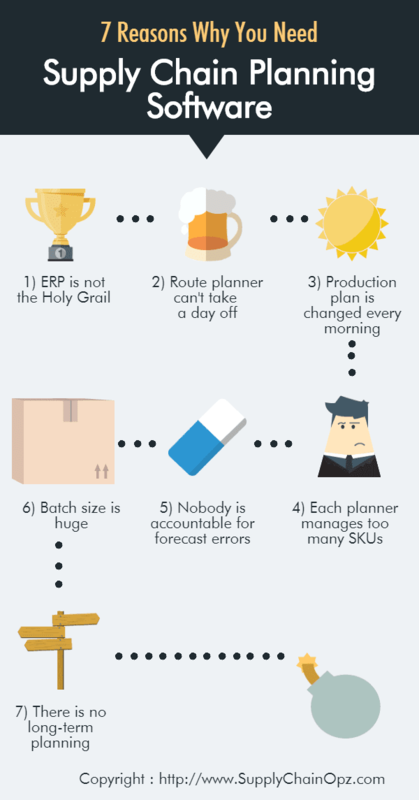 If you already have an ERP system in place, good planning software can a very good addition. If you're still doing the vehicle routing manually, you'll notice that the quality of the route is not very good. The reason is that many route planners have developed their own unique ways to handle real-world constraints such as time windows, truck ban time period, vehicle capacity limit, rush order and so on. The process is so complicated that nobody can imitate the planning logic, that's why a planner can't take a day off. In some industries such as Electronic Industry Services (EMS) in Asia, changing a plan every morning is the way of life. The reason contributing to this problem is mainly from the negotiation power of big customers who can ask for order insertion, deletion or cancellation at any time. Then, you need software that helps you create a plan quickly. How many SKUs should a planner manage? A generic answer is something around 500 SKUs. If your planner is currently dealing with 2,000 SKUs or more, using a spreadsheet analysis can be problematic. A demand forecaster usually feels a bit lonely because he/she is to blame for the errors. The good S&OP software can be the ideal solution that brings marketing, production, logistics and finance department together and creates a realistic demand and supply plan. It goes without saying that a big production batch drives cost down a lot due to lower machine set-up and higher yield. The drawback of big batch size is the lack of responsiveness. Good planning software can help to create a more flexible plan without sacrificing too much of the economy of scale. Have you ever wondered what you should do for the next couple of years to come? Most companies do strategic planning such as industry analysis, competitor analysis, new product development road-map and so on. The problem is that supply chain people usually don't take part in this kind of initiative. Then, the implementation of supply chain planning software is highly recommended. - Sodhi, M. S. (2003). 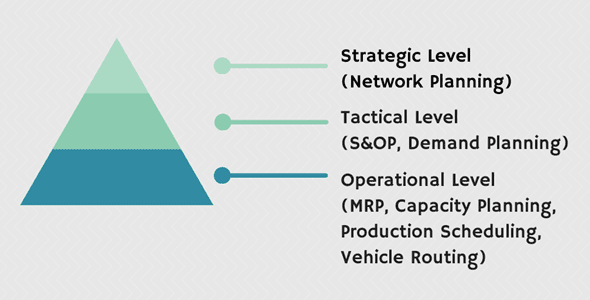 How to do strategic supply-chain planning. MIT Sloan Management Review, 45(1), 69.